Water meters, for domestic consumers at least, have only been around for a couple of years, basically since the service was privatised. Prior to that households in the United Kingdom were charged an amount for water and sewage services based on the rateable value of their home, and most homes that don't have meters still are. The rateable value of a home is a value based roughly on the amount of rent that you were likely to get for your home and was used mainly to calculate the rates charged by local councils for services. Since those 'rates'; were replaced, initially by the disastrous poll tax and then by council tax, the rateable value is only used for water rates. So those houses that do not have meters pay a largely arbitrary rate controlled by an antiquated notion of house value. Meters are generally now installed by default in new housing projects so most houses built in the last fifteen to twenty years are likely to have one. House built earlier will be on the flat rate charge unless the householder has asked for a meter to be installed in the past. It's often possible to fit water meters to older properties although sometimes, usually where pipes are shared by a number of properties, it can't be done. 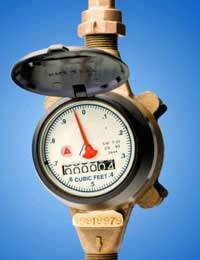 In some areas if the water company cannot fit a water meter they will switch you to a rate based on their estimate of your usage, rather than the flat rate, if it would lead to a cheaper bill. Should I be on a Meter or Not? So are water meters good or bad? Certainly the general consensus of opinion seems to be that installing a water meter in a home that's currently on a flat rate will usually lead to a drop in the annual bill. Obviously it will depend on how much water is used, but more of that later. There are many people who object to water meters on the grounds that they put the onus on saving water, something that most people have realised needs to be done, on the less well off. If you are poor and on a meter for any resource, you are obviously going to use as little of that resource as possible in order to cut your costs. But if you have enough money not to bother whether your water bill goes up or down by a couple of hundred pounds each year then you are less likely to worry about conserving water. On purely financial grounds, generally speaking, if you are in a large house and there aren't that many people living there, perhaps because your children have left home, a water meter is likely to be cheaper. Conversely, if you have a small home with lots of people living there, perhaps a shared home full of students or young working people, then the flat rate may well be cheaper. There are a number of places where you can check to see if you would be better off on a meter. Most water companies will have calculators that they can either talk you through on the phone or send through the post. If you have access to the internet, a quick Google for 'water meter comparison' will throw up a number of sites that can help you out. Water meters used to be charged for but most water companies now offer them for free. And some allow you to switch back to the flat rate within 12 months if it turns out that you aren't any better off. So it's worth doing the sums and then finding out what the situation is with your water company if it looks like it will save you money.